The best way of ensuring a long life in good health is to have the best start in life, a decent education, a warm and loving home, and an income sufficient to meet our needs. Or to put it more simply, a job, a home, and a friend matter most to our health. The evidence about these wider determinants has existed for years and it is now widely acknowledged that good health is about much more than healthcare alone. This rings truer than ever today. There is clear evidence that good work improves health and wellbeing across people’s lives, boosting quality of life and protecting against social exclusion. There is also clear evidence that conversely, unemployment undermines our health, increasing our risk of limiting long-term illnesses, poor mental health, and health-harming behaviours. Whilst unemployment increases the risk of developing these conditions, it is important to recognise that it works both ways, with long-term conditions themselves acting as the barrier to gaining and retaining employment. Therefore, the relationship between health and work is cyclical, with a healthy workforce having synergistic benefits for workplaces, productivity and the economy. 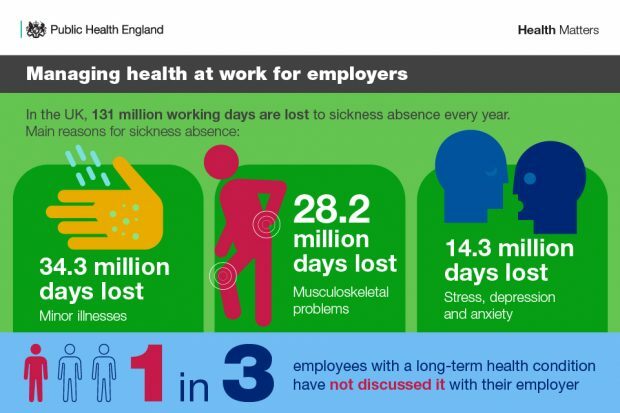 In the UK, 131 million days are lost to sickness absence every year, with the main reasons being minor illnesses, musculoskeletal problems, and stress, depression and anxiety. Looking at the wider economy, combined costs from worklessness and sickness absence amount to over £100 billion annually. 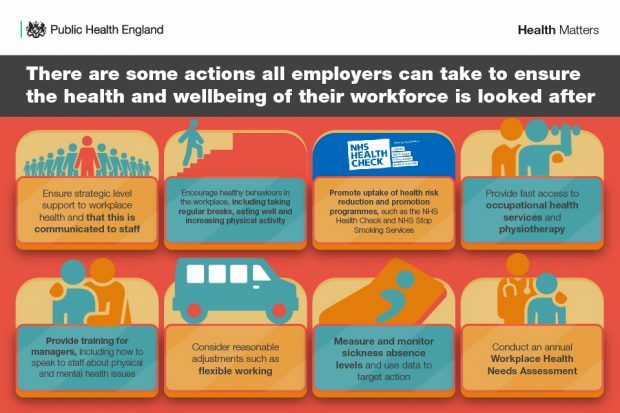 Our latest edition of Health Matters, PHE’s professional resource, suggests some actions that all employers can take to ensure the health and wellbeing of their workforce. It also outlines the range of relevant PHE resources and Business in the Community (BITC) employer toolkits, which can be used to inform decisions around specific issues in the health and work agenda. What can local authorities and the NHS do? Collaborative work between partners from across the private, public and third sectors is essential for creating pathways to good jobs and breaking down barriers to getting a job. Local government play an important role in bringing these partners together. The NHS Health and Wellbeing Framework and Creating healthy NHS workplaces toolkit sets out actionable steps for the NHS focusing on the leadership, structural and cultural building blocks for improving staff health and wellbeing, as well as the core health areas to focus support for staff. The NHS and local authorities are in a unique position, as in addition to the role they play in enabling employers to take care of their workforce’s health, they are also employers themselves. In fact, in some areas they can be the main employers with the largest workforce, and can therefore prioritise the health and work agenda in the same way that other businesses can. 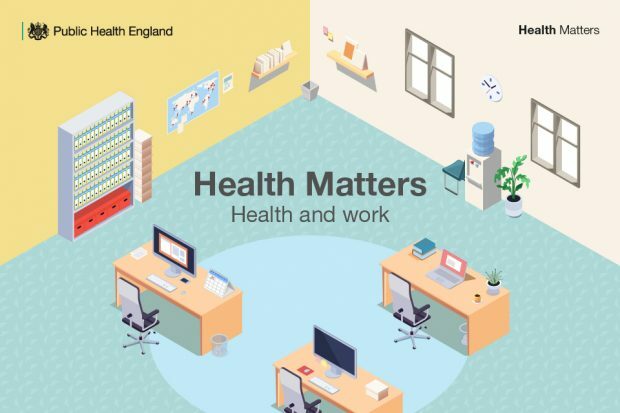 Read this edition of Health Matters to find out more about specific actions for employers in general, local authorities and the NHS. Visit the Health Matters area of GOV.UK or sign up to receive the latest updates through our e-bulletin. If you found this blog helpful, read our previous Health Matters blogs.